Contrary to what some folks think, we’re not just a place that makes or sells custom Batmobile model parts. Our charter/mission/scope here is to try to cover all aspects of Batmobile (and other Bat vehicles) model or toy collecting. We spend a lot of time talking about upgrade parts and such, but as we spread our wings and enter into PMB! V 2.0 this Spring, we’re bringing other aspects of our world back into focus. “THIS IS A BEAUTIFUL MASTERED OF THE FAMOUS 1966 BATMOBILE IN A HUGE 1/12 SCALE. THIS MODEL COMES WITH DETAILED TURBINE ENGINE, OPENING DOORS, OPENING HOOD, OPENING TRUCK, LIGHTS. PLEASE ALLOW 4-6 WEEKS FOR DELIVERY!!! COMES WITH A FULL MONEY BACK GUARANTEE AND A 10 YEAR WARRANTY.. 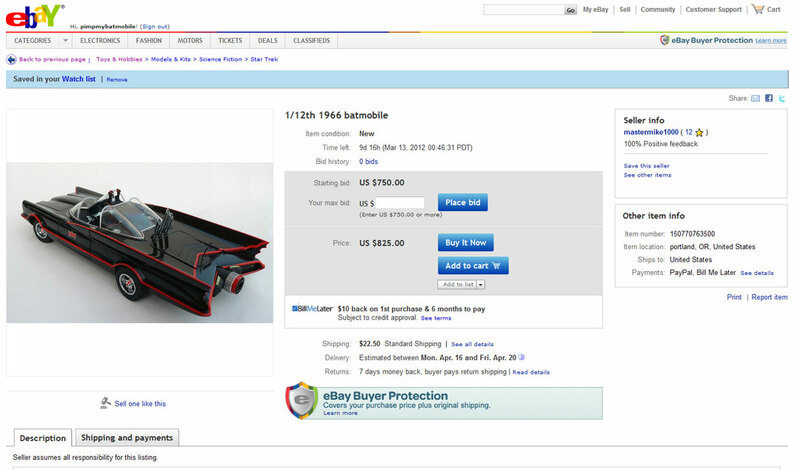 It also has an opening bid of $750.00, a Buy-It-Now of $825.00 and, perhaps most interesting – it only has one photo up and it is a rear shot of the Hot Wheels 1:18 Batmobile. Okay. So, as far as I know, I don’t know Mike or Don or any place calling themselves “Extreme Reproductions.” It could be somebody that we know. And who knows, MAYBE they really do have a 1/12th custom, made to order Batmobile they make and sell. But to put an eBay auction up for this type of thing, at that kind of price, with only a user feedback rating of 12, with a single shot of something we all recognize as NOT a 1/12th OR custom model of any sort – – well that’s going to get us talking at the very least. Well see, that’s where it all breaks down. Because we can’t look past all that. Maybe the all-caps thing. But to everything else up there, we give a hearty “What’s Up With That? !” I’ve contacted the seller. I will report back any followup we get from these folks. As I said before – Who Knows? It MIGHT just be the coolest big Batmobile model that we’ve ever seen! But until we get some more info – I wouldn’t advise hopping on that $825 buy it now button. Looks like a scam auction……..The only 1/12 that I know of was trash done many years ago……buyer beware! And now the seller has ended the auction early because “the item is no longer available”! Good job, Scooter! Followup Update: Tim actually found the company and the owner and sent me a link to their profile on manta. I have contacted him and it looks like the guy is a modelbuilder who may have worked for ILM at one time and is currently offering custom model and vacuform work. I hope he’s legit, but that doesn’t really answer the way he listed the Batmobile model originally. I would love to see their Batmobile model and even show it here. If they’re just trying to circumvent I.P. issues, they’re going about it the wrong way. Will post back when I make better contact. Velkommen til Pimp My Batmobile! Tim er en af de bidragydere og modelers her. Men løbehjul skriver artiklerne. Lad os vide, hvis vi kan hjælpe dig på nogen måde.